We received an opportunity to try out and review the unit study The Curiosity Files - Puffer Fish. Currently, we are loving unit studies for science and history, as well as letting the kids direct some of the topic interest in these areas, so this seemed like a great fit for us. With two school age children, it's hard to find science programs that hold the interest of a kindergartner and a third grader, while still presenting the material at their respective levels. At the same time, I really love when they can study the same subject material. It seems like we can do so much more when they aren't learning about completely different subjects. Unit studies seem to be the best compromise--the kids can learn about the same topic, participate in many of the same activities and experiments, then I can differentiate in the final product. What is The Curiosity Files? The Curiosity Files is a series of unit studies in e-book format, published by The Old Schoolhouse. After purchase, the PDF file is downloadable, and does require a PDF reader to view as well as a printer to print the assorted work pages. 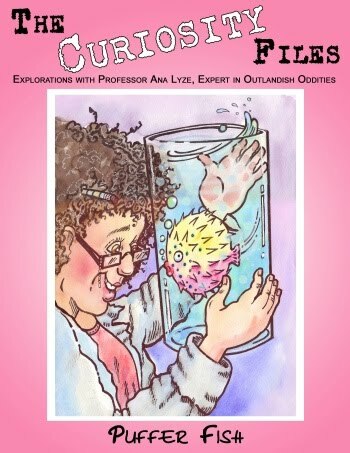 The series, recommended for ages 8-13 years, features Professor Ana Lyze who specializes "in the obscure, the abnormal, and the bizarre," and her discoveries of unusual animals, insects, weather, gems, and more. Like many kids, the truly bizarre seems to intrigue my kids. While other kids picked typical zoo animals to study in Faith's zoology class last year, she chose the platypus. All this leads to a variety of options, from using the unit as a science based study only, to creating lapbooks, to using it as a full unit study across several disciplines. Our choice was creating a notebook/lapbook from the materials while still using our core curriculum in certain subjects. With 85 pages (though covers and advertising make up 6-7 of those), Puffer Fish provides lots of material for a full unit study or just a science based unit. Although we focused mainly on the science aspect of puffer fish, the math and language sections provided a nice break/supplement to our regular curriculum. I was also pleased with the addition of handwriting pages and verses to use. I like handwriting practice to relate to some part of our curriculum and it was nice to have it already included. As a bonus, several templates for a potential lapbook are included. Even if you don't choose to make a lapbook, mini-books can be fun to create. We have really been enjoying lapbooks lately to showcase our work, so any help in that department is appreciated. The material was very age appropriate for Faith (age 8.5 years, 3rd grade). Some of the material beyond Ben's level (age 5.5 years, kindergarten) but that was to be expected. With some simple modifications, he was able to do many of the activities and enjoy learning about the puffer fish too. I wouldn't hesitate to purchase other Curiosity Files to use with both children--the benefits to using the same unit outweighed the modifications needed for kindergarten. Word searches and crossword puzzles - Faith loves these. They provide a great refresher on what we've learned and she really enjoys word puzzles. Web resources within the PDF - I really appreciate links being given, versus some units we've tried that say "look up information on topic z." I can look things up, but it's much better if a list of relevant resources are provided. Book list - Similar to web resources, I totally appreciate having a list to start with than having to find my own. Arts and craft ideas - F&B love making things and the craft ideas were wonderful. We did made the puffer fish plates and Faith enjoyed the step-by-step drawing instructions, she's my aspiring artist! The Curiosity Files Puffer Fish e-book is available for purchase here at the Old Schoolhouse store, for $6.95. Other Curiosity Files e-books are also available for purchase, ranging in price from $1 to $6.95, with a 9-pack bundle available for $46. All files are downloadable. The CD version of the 9-pack is also available for $49. I received my copy of the Curiosity Files Puffer Fish from The Old Schoolhouse Crew as a tryout for their review team. The copy was given to me free of charge to use with my children in exchange for writing a review. All opinions expressed are my own.